Frances Sophia was the first child of George and Hannah Martin. 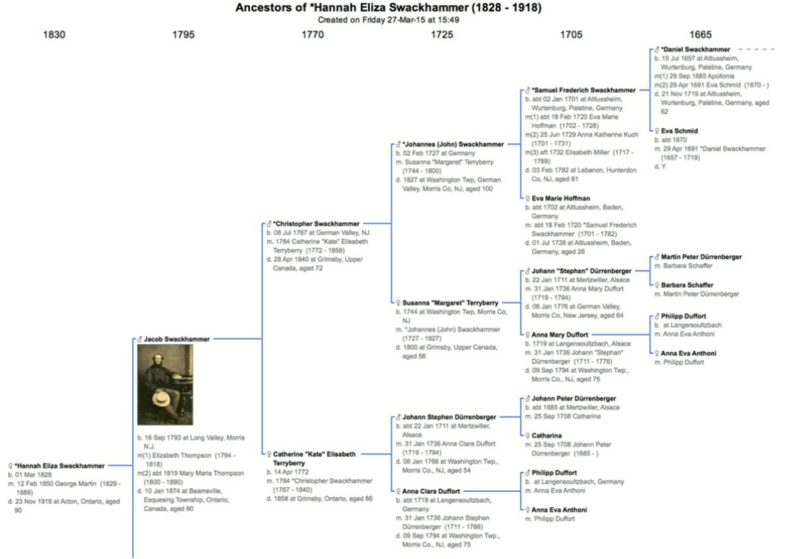 She is my great-grandmother and you can find more information on her own page. Frances Sophia Martin. George and Hannah's second child was another girl. Mary Emeline or "Emma" as she was called was born approximately two years after Frances, in 1853. The exact date is unknown. She was born in Erin Twp. Wellington County, Ontario on the family farm. In 1881, they were living in the village of Acton with their infant son George A, one year of age. Their married life together would not be a long one. On the 23rd of April 1884 Emma gave birth to a baby girl. Both mother and daughter did not survive. Her death was noted in the local newspaper. The funerals of Mrs. Donald Mann, on Monday, and Miss Julia Moore, yesterday afternoon, were two of the most largely attended that have ever taken place in Acton. In connection with the former Elder O. G. Hertzog, of Suspension Bridge, preached one of the best sermons that have ever been heard by our citizens on the subject of death and resurrection, and very interesting and most impressive service was conducted in the Methodist Church yeasterday by Re. W. Bryers, and Captain Webb of the Lord's Army, after the interment of Miss Moore. In both of the above cases the bereaved friends have the comforting assurance that their love ones have joined the happy company in that better and brighter home." Sarah like her sisters, was born in Erin Twp. Wellington County, Ontario on the family farm. She was born in 1855 but the exact date is unknown. She married Charles Alexandra, sometime before 1888 and bore him two children. They were removed from Erin and lived in Lambton County, not far from her elder sister Frances. The first Laura, born April 17, 1888, then Edward, born September 23, 1890. It would appear that she died due to complications after the birth of the second child. The following death notice appeared in the Acton newspaper. The death of Mrs. Chas. Alexandra, of the township of Moore, Lambton Co., daughter of the late George Martin, Erin which occurred last week while on a visit to her mother, was a circumstance of great sadness. For several weeks her sufferings were intense but she bore them with christian patience until God called her home. Her end was peace. Her remains were interred at Churchill, and Rev. Mr. Brenanstahl, of Everton, preached an able and instructive sermon on the occasion from Job 14:14. Mrs. Alexandra leaves a sorrowing huband and two little ones. The marriage of Mr. Nelson Martin of Vancouver City B. C., a former Erin boy to Miss Mary Denney, daughter of Robert Denney, Beq. was followed next day by choir embarkment for Vancouver City. Their many friends in Acton and vicinity join in congratulations and best wishes for happiness and comfort in their far west home. I am unaware of any family or the death of Nelson Martin. Second son of George and Hannah, Thomas was born in 1860. He remained in the area until after 1911 as he is listed in the Acton census for that year with his mother Hannah and his wife Marion Henderson. He and his wife Marion were living with her brother Daniel Henderson in 1901 and Thomas was working on the farm. They had three children P. John "Jake", born 1894, Annie M. born 1900 and George R. in 1905. Little else is known about Thomas and his family. 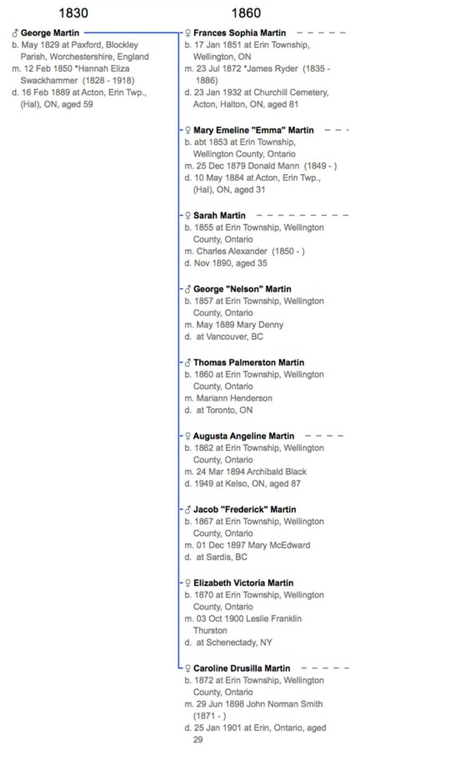 Augusta Angeline Martin came into the world May 11th, 1863, and fourth daughter of Hannah and George. She would remain at home until she was in her thirties. She married Archibald Black originally from Shelburne, Ontario and they would settle in the Halton area. A very interesting and pleasant event took place aT the residence of Mrs. H. E. Martin near Acton, on Wednesday evening, March 24th, the occasion being the marriage of her daughter, Augusta Angeline to Mr. Archibald Black, of Shelburne. The bride was attended by her sister, Miss Lizzie Martin of Acton and the groom by his cousin Mr. J. Barber, Hillsburg. The ceremony was performed by Rev. P. Baker, Everton. The esteem in which the young couple are held by their friends was evidenced by the beautiful and useful presents received. Their many friends join in wishing them a happy and prosperous life. Archibald and Augusta would have six children during their marriage as follows: Archibald, Emma, George, Lora, Edna, and Anna They started out their married life in Acton but then moved to Kelso. In 1921 Archibald sr. is listed as a teamster farmer in Kelso. At that time only the four girls are still living at home. Augusta's death notice was in the Acton Free Press, 17 Mar 1949 , page 8 , column 1. She would have been in her 86th year. I have found some possible information about Jacob Frederick but nothing that I can confirm. Elizabeth or "Lizzie" as she was nicknamed, was born in 1870 as all the others in Erin Twp., Wellington County, Ontario. She was the second youngest of the children born to Hannah and George. Elizabeth married and American Leslie Franklin Thurston, in Johnstown, N.Y. on October 3rd, 1900. she was thirty years of age. I also know very little about Elizabeth, whether she had any children or much about her life. She died in Schenectady, N.Y., but I do not have a date for her death. I was able to find the marriage notice. A very pretty wedding was solemnized last Wednesday evening, 3rd October, at the residence of the pastor of the Reformed Church, when Leslie Franklin Thurston and Elizabeth Victoria Martin were united in marriage by Rev. John van Burk. The ceremony was witnessed by twenty or more relatives and intimate friends of the bride and groom. Many beautiful remembrances were presented to the young couple, and will find a place in the busy home to be occupied by them. at No. 435 North Perry Street. Mr. and Mrs. Thurston received the hearty congratulations of their friend beneath and arch of autumn foliage - Johnstown Republican. "The Many friends of the bride in Acton and vicinity unite in extending best wishes to the happy couple." Just two years later she died. A Young Wife and Mother Taken. The remains of Caroline D. Martin, daughter of the late George Martin, Erin, and wife of Mr. Norman Smith, Acton, were tenderly laid to rest in the family plot at Churchill Cemetery last Wednesday. The funeral was conducted by Rev. James McLeod, the pastor of deceased, and Rev. H. A. Macpherson,and was largely attended. Deceased had been ill for some time and died on Monday, 28th January. She leaves a sorrowing husband and two motherless children to mourn her departure.